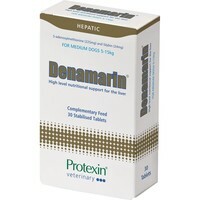 Protexin Denamarin Tablets is a liver supplement which has the following benefits. It contains pure, stabilised S-Adenosylmethionine (SAMe) and enteric coating to prevent isomer degradation of SAMe. It also contains Silybin complexed with phosphatidylcholine for increased bioavailability. Extensively researched for proven effectiveness. My 7 year old dog was diagnosed to have advanced liver cancer in the end of April. She has had one capsule of Denamarin every morning and she is also on special liver supporting diet. Today she is lively and strong, nobody who didn't know she has this cancer would think there is anything wrong with her. My cat refused to eat these tablets when ground up with his food. He would eat his food with other tablets ground up. A large tablet for a cat to swallow, and if your cat won't swallow tablets this is a huge issue. I would recommend the manufacturer make the tablet smaller and make them taste better. Purchased these for my 16 year old cat with liver problems. Found them very hard to give a cat so ended up giving them to my 16 year old dog who also has liver problems and they worked very well in bringing his levels down.